The editorial board of Melilah invites submissions for its 2017 volume, for which the theme is ‘Gender in Jewish Studies’. 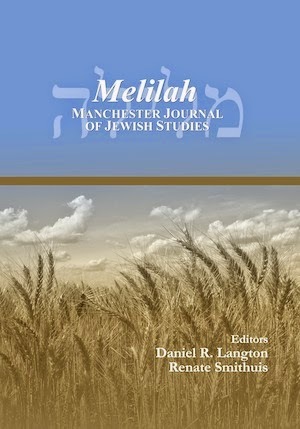 The intention is to focus on the development and application of method and theory over the last four decades, and to interrogate what difference gender-sensitive approaches have made in all areas of Jewish Studies including, but not limited to, textual, archival, material, ethnographic, and historical studies. Interested authors are encouraged to contact the guest editor, Katja.Stuerzenhofecker@manchester.ac.uk, in advance. For inclusion in the 2017 volume, papers should be submitted by 31 July 2017. Papers submitted after that date may be considered for publication in a future volume. All papers will be subject to peer-review before acceptance for publication. Suggested word-length: between 3000 and 10,000 words. For this journal there are no article processing or submission charges. All author(s) hold the copyright and retain the publishing rights for their articles without restrictions. All articles submitted undergo full peer review. While the editors reserve the right to commission reader reports, authors are most welcome to suggest in their cover letter the names of appropriate experts as potential readers. Please provide your preferred name, title and position, the name of your department and institution, and your email and postal addresses. Please also include at the start of the article a 150-200 word abstract, and at the end of the article a bibliographic list of all works cited in the article. Please conform as closely as possible to the Chicago Manual of Style (16th edition) for footnotes and bibliographic entries. See the Chicago online guide's examples for books, articles, chapters, websites, etc. 1. Footnote markers follow commas, periods, colons and semi-colons. 2. End quote-marks follow commas and periods but precede colons, semi-colons, question marks and exclamation points (unless these belong with the quoted matter). 4. Please avoid the use of contractions like can't and don't. Please follow RSV and Danby for Biblical and Rabbinic abbreviations.